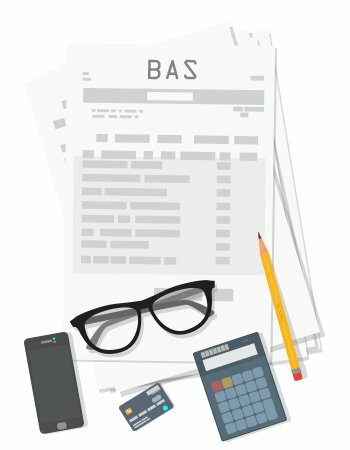 Everything you need to know about BAS and how Reckon One can help. Your business charges $50 for your goods or services so your customer will be charged $55. The additional $5 is the GST that needs to be paid to the ATO. Your business buys supplies, you will be charged 10% in GST which you can claim back from the ATO as a credit. When you complete a BAS statement you are essentially reporting the GST you’ve collected on your sales minus any that you’ve paid on your purchases, with the difference being your refund or what you owe to the ATO. Your BAS can also include PAYG withholding and instalments, wine equalisation, fuel tax credit and fringe benefit tax if these apply to your business. Do I have to complete a BAS? If your business is registered for GST you need to lodge a BAS. If your business has a turnover of $20 million or less you can choose to lodge monthly or quarterly (over $20 million must report monthly). 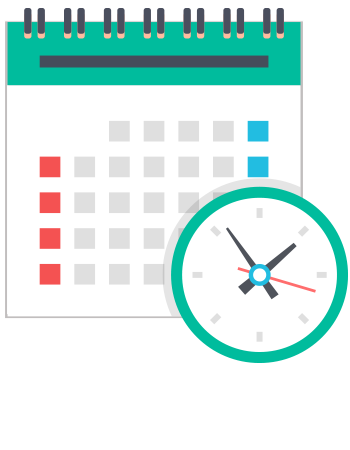 Note: If you use the services of a BAS or Tax Agent then you will also be entitled to an additional month to lodge for each BAS. 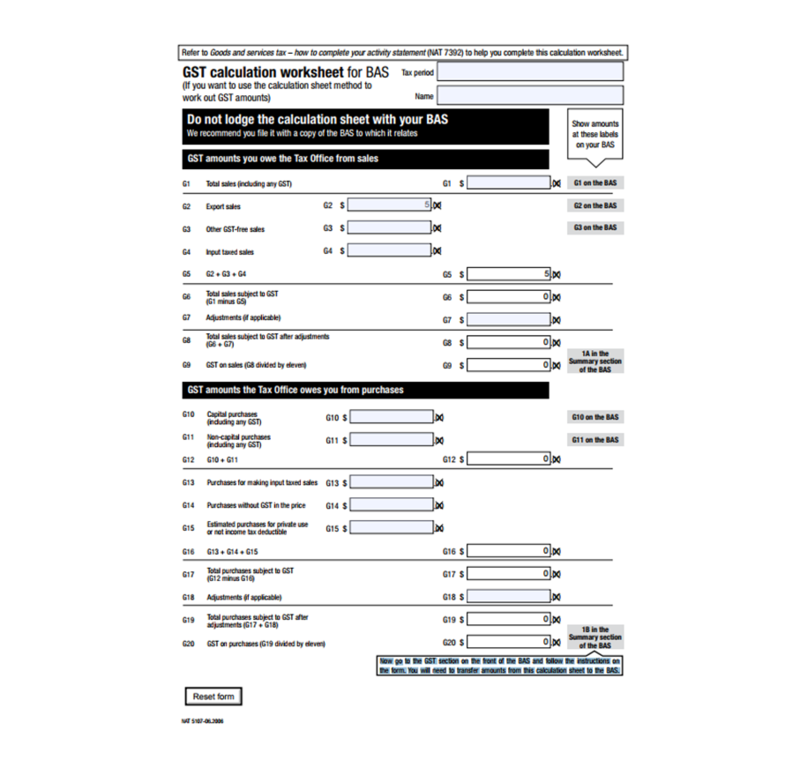 This worksheet allows you to work out GST amounts for your BAS form. Reconcile your accounts to ensure that all your information is accurate and up-to-date. This involves collating your business transactions such as receipts, invoices and ensuring they match your accounting information and there are no discrepancies. Now that your information is accurate it’s time to calculate your totals. You can do this via a report in your accounting software or adding up all your numbers if you use a manual method (see GST calculation worksheet). Once you have your totals, transfer them to your BAS form. Mail a hard copy to the ATO. 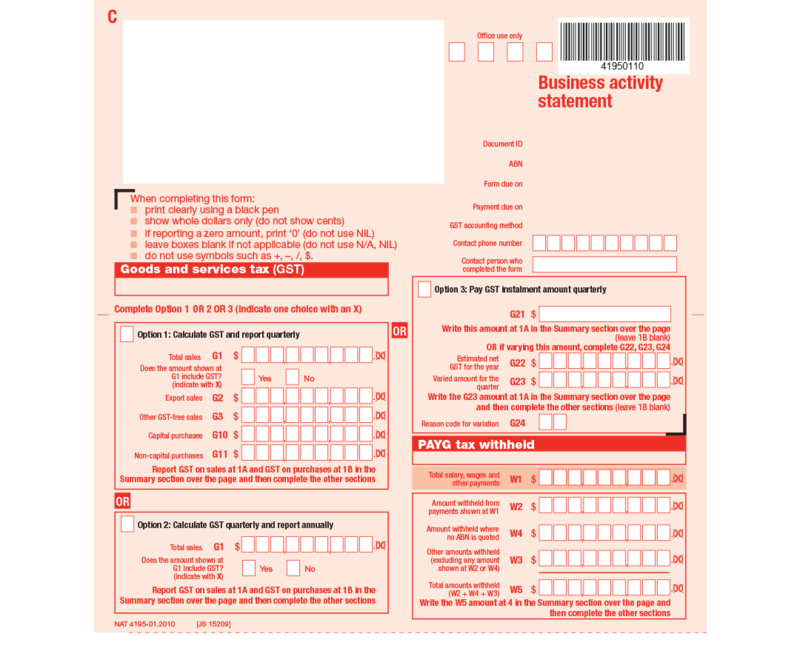 The ATO will send you the Business activity statement form with a pre-addressed envelope to send it back. Engage a BAS or Tax agent lodge for you. Whichever option you choose make sure you save a copy and update your accounting information with your figures. Run the Reckon One “Activity Statement (BAS)” report that will help you generate the exact figures to enter onto your business activity statement form. Save and mark as lodged to help you stay organised. All Reckon accounting products are Simpler BAS enabled including Reckon One. Follow our step by step video tutorial for calculating your BAS figures in Reckon One. 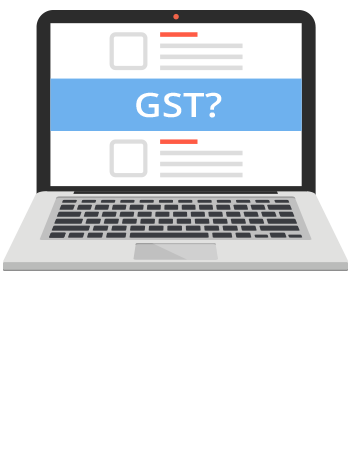 Reckon One assists you in completing your Business Activity Statement by totalling your GST transactions into the GST Summary Report. This report is prepared from the tax codes assigned to transactions. When you start using your Reckon One you need to configure your Book so that GST is properly tracked. Enable Tax Tracking by selecting Yes to the question “Are you registered for tax”. Confirm that the Reporting basis is correct – Accrual or Cash, and that it corresponds to your earlier selection. Select whether you want your amounts displayed as inclusive of tax – Gross; or exclusive of tax – Net. Also, take note of the Account Names your GST collections and payments are posted to. tick the additional taxes you want to track in this lodgement. Information about where each tax code will be shown on the BAS preparation sheet is available in TaxSettings, Tax codes and groups, in the Report label column. Your Book is now ready to record the GST component of your transactions. 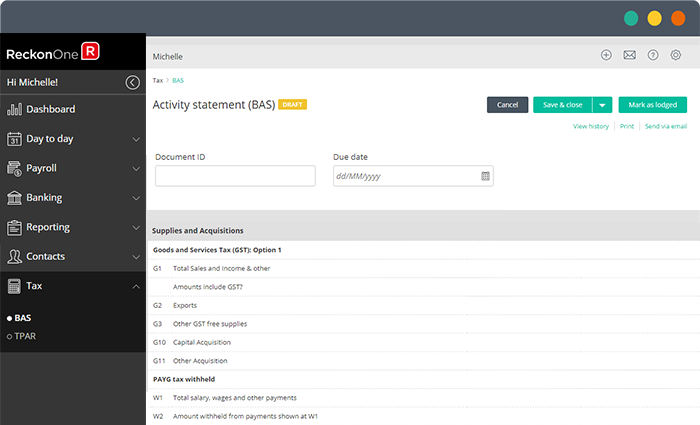 Your BAS form will open where you can view your amounts. Use these figures to complete your BAS Lodgement Form. When you have lodged your BAS Return, click on Mark as Lodged to note it. You’ll see the status of your BAS in the table. To process your BAS transaction, use a Journal with debits (or credits) to the relevant ledger accounts with the net amount credited to your bank account. Take control of your finances and keep track of receipts, payments and GST.